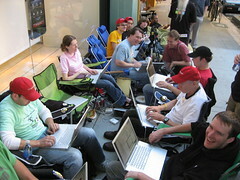 Lots of people here at the Palo Alto Apple store. Just got back from Lunch 2.0 at Simplyhired, right after the iPhone mania, they had Indian food (and we’re hand making Naan there) gave away squirt guns, were playing four square (I told you it was taking off) and I even made a tie dye shirt. They’re hiring too! Careers at Simply Hired: System Administrator, Web Applications Engineers, C# and PHP Web Developer, VP Product & Marketing, and Account Executive. I talked to a few of the developers about the ‘widget’ they’ve deployed into myspace a while back. I encouraged them to get involved with Facebook as quickly as possible, I think they’re already going down that path. Have you read my predictions on the open/close networks? There was about 200 people there at this well planned event. When I told the iPhone line that I was going to Lunch 2.0 they told me to bring the party back over, I have a feeling it was an equally good time. We missed the community manager Damon, who’s out in Thailand right now. If you’re not familiar with Lunch 2.0, you can learn how it got started from this video. I stopped by the Apple Store last night, then went home to my nice bed, I’m not buying an iPhone but am impressed by the buzz that a company has been able to generate for a handheld computer. Steve Jobs is a master marketer, and his technology is ok too. I stopped by again this morning, there are nearly 100 people there in line, many companies are providing free shirts, free food, and free prizes. The press was there, TV stations, ustream stations, JustinTV, Digg, Rev 3, Zooomr, PodTech, and many other companies. Many folks from the community were at this street fair. Scoble has the story, and I attribute him for being the first and second in line (him and his boy) and getting so many marketers to come down and feed them. I guess what I’m most impressed about is the clever marketing that’s happening. Zooomr used it’s stickers as the “placecards” for determine the order who is going to buy a phone, smart, every person in line who wants an iPhone has a zooomr sticker on them. Smugmug, an apple store, and others gave away free shirts. Even Apple came out and handed out water, good show. I jumped on the Zooomr TV show for a while, at one time there was 700 people watching us, you should join in right now. Chris Yeh called me and told me that he’s going to give away an iPhone. Those who sign up on Ustream.tv can be eligible to win the iPhone, details here. You can register for Ustream.tv on the registration page. So if you have a real life, or a real job and don’t have time to stand in line you should sign up. You should know that I’m really excited about Ustream, so much so that I advise their company. Digg traffic is notorious for a huge spike then a return to normal traffic with residual effects. Last night Julio Garcia text messaged me that I was on Digg from coverage at Searchnomics conference. I noticed at the Marissa Mayar keynote that I was one of the few or only bloggers that were live blogging, I guess my hard work paid off. I’ll guess that 5% of this traffic will stay with me over the next week, but it you’re here because of Digg, stick with me if you want to learn about Web Strategy, how companies use the web to connect with customers. I think that I was submitted by my new friend at Pro Net Advertising, who you should consider hiring if you like traffic. I live my blogging life pretty open, and I’ve published a link to my traffic today, as well as my stats for the last 12 months. I don’t have “A-list” traffic, but I’m ok with that. Look for me today on Zooomr TV, I’ll be heading over to the Palo Alto Apple story for the circus. I’ll see you tonight, we’re having a street party at the Palo Alto Apple store at University Avenue. There’s a lot of media being created, from the mainstream press, to Zooomr TV doing it live. Jeff Clavier says that Robert and Patrick are the first two people there. They were there at 11:30 when I was in the area. I ran into Ross Mayfield on the street, and I know that Kevin Rose, Thomas Hawk, Kris Tate are also there. Apple iPhone for me? Nah, over hyped and over priced, as I understand it the total cost of ownership for the first year will be way over $2000 when you add up provider costs. Lastly, remember when the first gen iPod came out? Look at it now, what a clunker, I’ll wait for future generations. Yeah, I’m busy, from a 7am Second Life tour to being at this conference this afternoon then on to the events tonight, see you there!